GOOD WOOD TOUR: Sahrs, Barrels, Funk and More! Maybe you've taken our brewery tour before, or visited another brewery, and you think you know everything there is to know. Malts, hops, yeast, got it. Well...THINK AGAIN! How about beers that have spent time in bourbon or wine barrels? Want to learn about sours and beers that undergo more unusual fermentation methods? Are you a fan of the kinds of beers poured at our GOOD WOOD festival each winter? This tour is a barrel room tasting-focused run through four unique beers from our barrel aging program, with a discussion about the processes used to make each one. Click here to sign up for a tour THIS SATURDAY, September 8. This $20 tour is best for SEASONED BEER FANS interested in learning about our barrel aging programs and some of the more unique beers styles we brew. The tour and tasting will last about forty-five minutes... but you're welcome to linger in our Brewpub afterwards to enjoy a beer with newfound feelings of beer education. Big Hop Harvest 6.8% Each fall, we take your year-round favorite, Big Hop IPA and do something special with it to celebrate the September hop harvest. There’s a small window where we can get fresh-picked, un-dried, locally grown hops to toss into the kettle. These “wet hops” provide a truly unique flavor and aroma, almost like the smell of freshly cut grass – if your lawn was completely planted with American hops! Available NOW and coming in Cans SOON. Britsburgh Ale 4.9% Brewed for the annual Britsburgh festival of all things Anglophile here in Pittsburgh, every year we make a different beer in a traditional English style. This year is a Scottish ale with Honey & Heather Tips that tastes great on cask and on Nitro. So good, in fact, that we'll soon be releasing in our first-ever NITRO CAN. Stay tuned for details. Guaba Guaba Hey 4.9% A kettle sour beer infused with fresh Guava & Pineapple, we're debuting this beer at Construction Junction's Big Pour as our "Big Pour Brew" (see below) and then on draft at both our spots. Hey ho, let's go get some! BBA Nunkin 6.8% With a summer of wonderful weather, we've had a bumper crop of Nunkins come in this year. We're happy to report that before October is upon us, we'll have a round of fresh-picked kegs of Bourbon Barrel Aged Nunkin to tap at a seasonally appropriate time... maybe even a few cans of it too, if we can sort that out! Smokestack Heritage Porter 5.4% Our favorite beer to cook & grill with, we make a limited amount of this beer each year! Rescueberry Shake 7% Drink some GOOD BEER, do some GOOD, as proceeds benefit the GOOD WORK of 412 Food Rescue. Draft and Cans of this milkshake IPA brewed with "rescued fruit" are winding, so get shakin! For the Culture Brut IPA 7.9% Our Fresh-Fest Collaboration with Black Brew Culture remains a summertime favorite, light in body, even lighter in sweetness, and hoppy all day long in cans and draft, while they last. Have you checked out the Pittsburgh Brewery Guide website yet? It's pretty great; it'll help you plan a trip to all the local breweries, suggest an itinerary for out-of-town friends, or just tell you which breweries are dog-friendly or serve food. Click over today to PghBreweryGuide.com ! What's a better pairing than tacos & beer? Trick question, there isn't one! 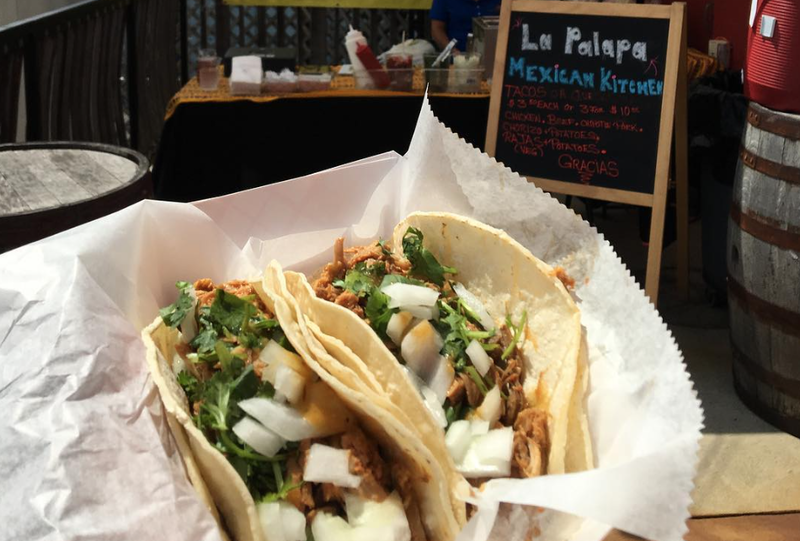 Our friends at La Palapa are at the East End Brewpub in Larimer every Friday night with tacos & quesadillas. PUB QUIZ, Buzzworthy Pub Trivia at the Brewpub starting at 7pm. Free to play! GOOD WOOD TOUR 1-2pm at the Brewpub in Larimer. Click here to rsvp! POETRY & PINTS, now at the Taproom in the Strip, from 6-8pm. GRAINS TO GLASS BREWERY TOUR 1-2pm at the Brewpub in Larimer. Click here to rsvp!